Honey Bees Wanted!! | Living the Good Life in Gaston County! It is that time of the year again when Honey Bees outgrow their current homes and swarm to find new ones. If you are in Gaston, Cleveland, Rutherford or Lincoln Counties and see a bee swarm in a tree, on a brick wall, on your car, light post, etc. give me a call for a FREE removal!! We have also started offering bee removal and rescue services resulting from numerous calls regarding bee swarms or bees in structures. We have added this service to our general contracting business, StoneWright Home Services, LLC. WE REMOVE BEE HIVES AND RELOCATE THEM TO OUR FARM IN GASTON COUNTY, NORTH CAROLINA. If you have bees in a tree or in your home or business give us a call. Many bee removal services only remove bees from your property, however, we specialize in removal and repairs. We will give you an estimate to remove and make any needed repairs. We do not leave you to find another contractor to put your home or business back together. We are a licensed NC General contractor and fully insured. 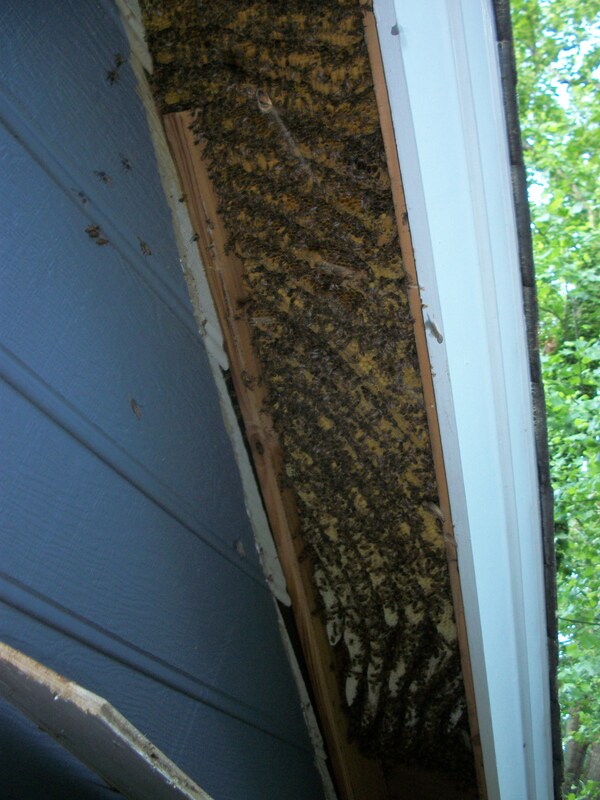 The average bee removal from a structure (wall, roof, soffit, floor,etc) takes 6 to 8 hours to remove the bees and then several more hour to complete the repair. Call 704-577-4323 for free estimate or email us at bees@stonewrighthomeservices.com. We serve Gaston, Mecklenburg, Lincoln, Cleveland, Rutherford, and York Counties. We will also travel to any location in NC and SC for a structural hive removal and repair.